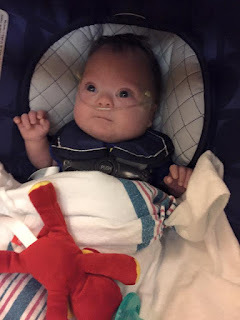 In a moment of frustration as I drive once again to the NICU, the current residence of my second child, I think, “I didn’t sign up for this.” I didn’t sign up for my life to be flipped upside down. For my life to take a new shape, a form I had never anticipated, and to be honest had never wanted. My thoughts then drift to the Christmas season that is upon us and I think Mary didn’t sign up for this either. What must it have been like for an angel to show up and break such news to her? The angel appearing and explaining that she was going to have a baby. I think that one might have come as a shock considering that she hadn’t been with a man. I doubt she was sitting there contemplating going out to buy a first response pregnancy test thinking, “could I be pregnant?” The angel then explained she not only was going to become a mother but she was going to give birth to the son of God. Okay hold on, how does a person even respond to that news? I don’t think anyone could be ready or prepared to receive that news. It is hard enough to process and wrap your head around finding out you’re going to become a mom. That you are going to be in charge of this little human being, that is a lot to take in in any typical pregnancy. I can just imagine the “you’re joking, right?” moment that had to be going through Mary’s mind. The “how is this possible” and possibly the “why me” moments that had to follow in the time following the news. What was it about her that made God select her for this role? As usual though God had a plan. A plan so far from what Mary could have guessed or possibly wanted for her life. Her life, her world was changed that day. She more than likely had more questions than she had answers. Sure she knew the basics, she would have a son, he would be the son of God, and he would be called Jesus. What she didn’t know were the details. We don’t know what type of personality characteristics she possessed, maybe she wasn’t a planner like I am. Then again maybe she was. Maybe she thought she always had to have a plan in place, a map that her life would follow. It might have felt at times too big a responsibility to be placed on her shoulders. How does one prepare to raise the son of God? She might have felt that she was inadequate and not up to the task. She might have yearned for her nice clearly labeled map that she had worked hard to create. One that featured these typical children she had pictured and dreamed of, children that fit in perfectly in the landscape of her map. I remember thinking the first Christmas I became a mother that it brought along a new perspective for me. I felt that I could better relate to Mary, thinking of the love and feelings that come with becoming a mom. Just imagining the love she must have felt holding her newborn son in her arms as I cradled my infant son. Now as I become a mom for the second time it has given me yet another perspective. Mary didn’t give birth at 28 weeks and have to worry about health issues or have a birth diagnosis of Down syndrome. I didn’t give birth to the son of God, but I see the Christmas story from a new perspective. I didn’t have a typical labor story or a typical baby as I have watched my youngest son fight to grow and fight for his chance to live. Mary didn’t have a typical labor and definitely did not give birth to a typical baby. What to Expect When You Are Expecting doesn’t have a section that related to Mary’s pregnancy and birth story. Instead she had to trust God to help guide her as she prepared to raise his son. Having a path that is different and atypical can be scary, it can be overwhelming. What a beautiful, albeit very hard, thing God is doing in your life. A wonderful reminder to us all to have a willing heart toward the way God will bend our paths through life. I am glad for you to have Kaleb home and will continue to pray for your family as you adjust to it all.